The state of Wisconsin is perhaps best known for its world-famous football team, the Green Bay Packers, and its rich German heritage. What is often overlooked, though, is its stunning natural scenery. One area that is particularly beautiful is the Apostle Islands National Lakeshore. Consisting of 21 islands and a stretch of shoreline at Wisconsin’s northern tip, the area includes cliffs, sea caves, beaches, marinas, and trails. It is home to such diverse wildlife as black bears and bald eagles. 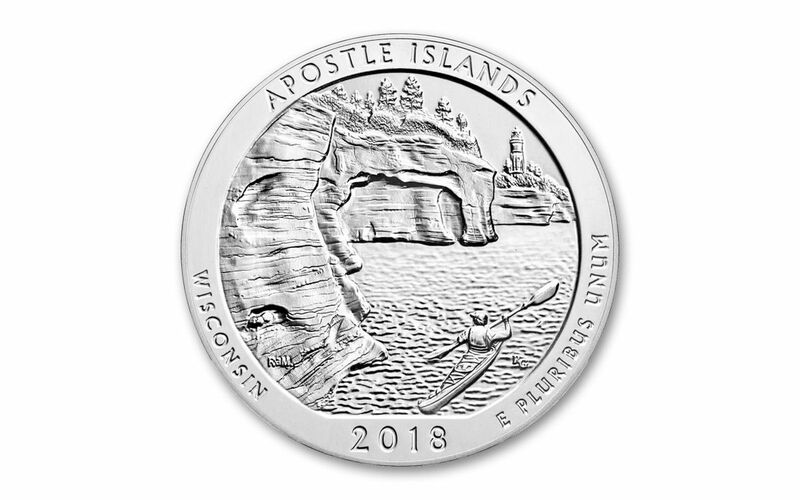 Now, this second issue of 2018 in the America the Beautiful series celebrates the area with this five ounce silver Apostle Islands coin. THE LATEST IN THE "AMERICA THE BEAUTIFUL" SERIES -- This 2018 five ounce Silver Apostle Islands coin is the second issue of 2018 and the 42nd overall in the America the Beautiful series, which began in 2010. STUNNING NATURAL SCENERY – The design features the sea caves of Devils Island and a lighthouse standing in the distance. Unlike many of the coins in the series, it also includes a person enjoying the scenery, in this case a kayaker paddling along the shore. This not only makes it easier for the holder to imagine himself in the scene while looking at the coin but may also inspire some to get outdoors themselves. 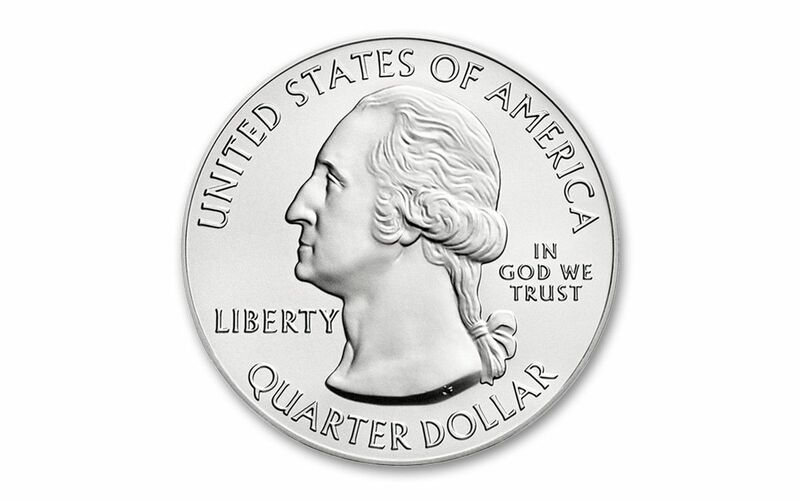 GEM BRILLIANT UNCIRCULATED -- Your coin will arrive to you in GEM Brilliant Uncirculated (GEM BU) condition, exactly as it left the mint. The America the Beautiful series has proven extremely popular since it began back in 2010. For those who have been collecting from the start, each release has provided a new and exciting way to discover and appreciate all that America has to offer. The Apostle Islands National Lakeshore in Wisconsin is a perfect example of a coin that presents collectors with a scene of America’s natural beauty that would likely be overlooked otherwise. 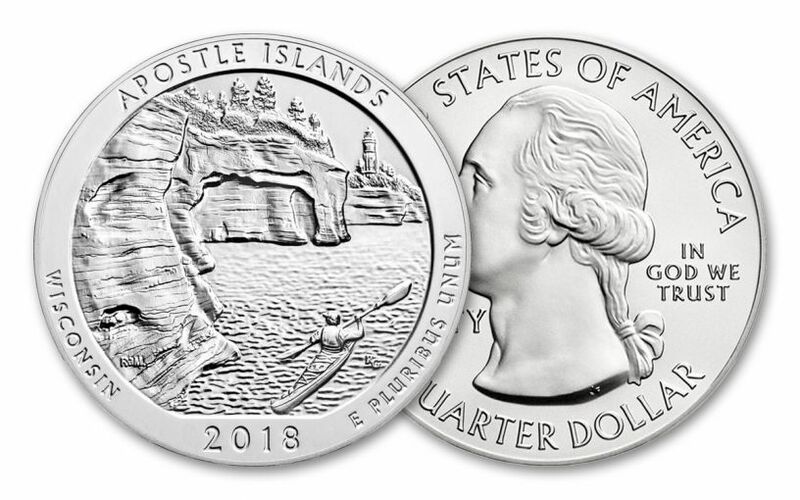 Although the America the Beautiful collection is considered bullion, its five releases every year mean that each new release is only available for so long, so add this 2018 five ounce Silver America the Beautiful Apostle Islands coin to your collection before it’s too late!